A few weeks ago, CX experts in the pharmaceutical and life sciences space gathered at PanAgora Pharma's 6th Annual Pharma CX Summit in Summit, New Jersey to share their experiences and best practices in pharmaceutical CX. Across the speakers and attendees, there was a consensus that customer experience measurement is a new, important, and growing space in the pharmaceutical world. Customer experience concepts may be new to your company, so the first step is to establish why it is important to focus on CX with key stakeholders. Providing a product is not enough anymore. In “Why Pharma Companies Can’t Ignore Patient Services," Accenture shows that 76% of patients expect their pharmaceutical provider to offer tools and support services. As more and more pharmaceutical companies provide services, the experience they provide will be a differentiator, and measurement is key to understanding the experience your company provides. However, trust in the industry is low. According to the Edelman Trust barometer, which measures consumer trust across industries, only 64% of consumers in 2018 trust healthcare companies, a decline of 2 points from 2017. A successful customer experience program will need to overcome this general sense of distrust in order to connect with patients and provide them with the services they expect. "As [patients] see that pharmaceutical companies are trying to help them more; instead of just 'refill, refill, refill," trust will improve," said Sean McDade PhD from PeopleMetrics. Garry Clark from Quest Diagnostics spoke about his experience getting the right mindset before building a measurement program. In his role, Garry’s first objective was stakeholder alignment. In order to shift to a customer experience mindset, Garry involved company stakeholders early on in the program development process, which allowed them to define a common objective for improvement of CX scores. Involving stakeholders early on allowed Quest to build a program to listen to their customers, implement changes at diagnostic locations based on feedback, and ultimately improve their customer experience scores. Start your CX measurement program by listening to key experiences that you directly control. The life sciences space is unique in that patients interact with a network of providers in order to get care (doctors, pharmacies, insurers, etc. ), and many of these interactions are completely outside of your control. Start with the key touchpoints that you own — such as patient onboarding or first infusion. Refining and improving these core experiences will provide quick wins early on that can be shared internally, and act as a first step in building a CX mindset across the entire patient journey. Dawn Lacallade of LiveWorld used this approach for a pharmaceutical client in the endometriosis space. Dawn, along with her client, identified the full patient journey for endometriosis patients and focused improvements on the larger gaps. In this case, one of the largest gaps they discovered was general awareness of the condition. To combat this, materials and outreach were created to target this early phase of patient experience, and as a result, patients now have greater access to materials that can help them understand their diagnosis. Navigating internal and legal regulations is a complication that is unique to pharmaceutical CX. Make sure this isn’t a stumbling block by working with a partner who knows how to navigate regulatory hurdles in the space and get a program started. 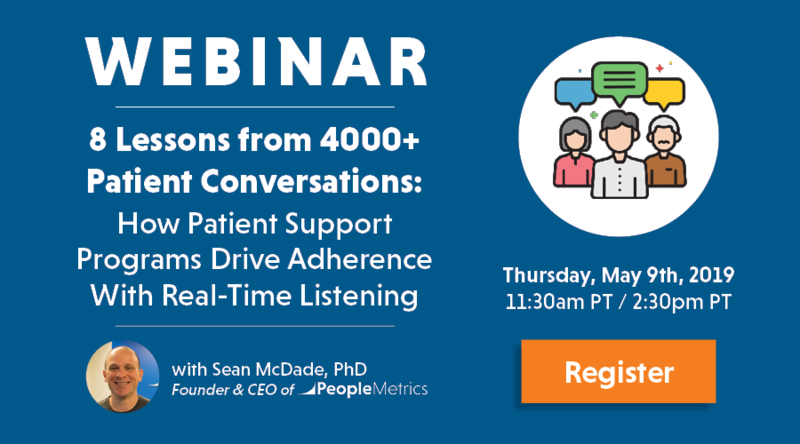 "Patient experience is more complicated than CX, in that when we ask for patient feedback, we have to report on things like adverse events and other things that we don't have to do in, say, hospitality," said Sean McDade PhD, Founder & CEO of PeopleMetrics. Is your survey program GDPR and HIPAA compliant? Are you set up to handle adverse events as they come in? Is patient information being securely held and transferred? At PeopleMetrics, our understanding of these varied regulatory needs has been essential in building survey programs that can receive regulatory approval, keep your patient information secure, and maintain confidence from stakeholders. Once you’ve honed your core experience, it’s time to expand. Patients and customers expect consistency, so if the service is lacking at other touchpoints (for example, after a year on therapy or after changing insurance providers), this reflects poorly on your customer experience as a whole. "Patients will have experiences with your brand whether you design them or not," said Sean McDade of PeopleMetrics, "Design with intention." Growing your customer experience program into your full suite of customer touchpoints is key to establishing a fully realized customer or patient experience. Building this out can be both internal and external. Internally, expand to other key touchpoints that allow you to better serve patients through the full patient journey. Externally, share targeted results with your vendors and partners. If customers provide feedback on how their specialty pharmacy or insurance experience could be better, share that with your partners and discuss how this experience can be improved — as this ultimately impacts how patients are interacting with your product. In the coming years, customer experience measurement will become more and more common in the pharmaceutical and life sciences space. As you start to build your patient experience, use these four lessons as a framework to ensure that your program is both manageable and shows return. Want to know how we can help you with your CX journey? Kirk Lohbauer is a Customer Experience Manager at PeopleMetrics. In that role, Kirk is responsible for developing and managing patient experience measurement programs for multiple pharmaceutical companies. In his 6 years at PeopleMetrics, Kirk has worked extensively in all aspects of CEM program development from initial specifications, crafting a suggested program and surveys, survey launch, and subsequent action-taking and improvements. Outside of the office, Kirk can be found bicycling around Philadelphia, going to concerts, and trying his best to read a book at his coffee shop instead of reading Twitter (with varying degrees of success). Click here to get in touch.